This article is about the leader of the 1966 Saint-Sylvestre coup d'état. For his son, see Jean-Bédel Bokassa, Crown Prince of the Central African Empire. Jean-Bédel Bokassa (French pronunciation: ​[ʒɑ̃ bedɛl bɔkasa]; 22 February 1921 – 3 November 1996), also known as Bokassa I of Central Africa and Salah Eddine Ahmed Bokassa, was the ruler of the Central African Republic and its successor state, the Central African Empire, from his coup d'état on 1 January 1966 until overthrown in a subsequent coup (supported by France) on 20 September 1979. Of this period, he served almost eleven years (1 January 1966 – 4 December 1976) as president (the last four years as president for life). For almost three years he reigned as self-proclaimed Emperor of Central Africa, though the country was still a de facto military dictatorship. His imperial regime lasted from 4 December 1976 to 21 September 1979. Following his overthrow, the Central African Republic was restored under his predecessor, David Dacko. Bokassa's imperial title did not achieve international diplomatic recognition. Born in Ubangi-Shari in French Equatorial Africa, the son of a village chief, Bokassa was orphaned at age 12. Educated in mission schools, he joined the French colonial army in 1939 as a private. He distinguished himself in the war in Indochina, winning medals and rising to the rank of captain. When Ubangi-Shari gained its independence as the Central African Republic in 1960, the new president David Dacko, who was his distant cousin, invited Bokassa to head the armed forces. In 1966, Bokassa used his position to oust Dacko and declared himself president. He then began a reign of terror, taking all important government posts for himself. He personally supervised judicial beatings and introduced a rule that thieves would have an ear cut off for the first two offenses and a hand for the third. In December 1976, in emulation of his hero Napoleon, he appointed himself emperor of the Central African Empire, with a coronation ceremony in 1977 costing US$20 million ($80 million today), practically bankrupting the country. His diamond-encrusted crown alone cost $5 million ($20 million today). In 1979 he had hundreds of schoolchildren arrested for refusing to buy uniforms from a company owned by one of his wives. Bokassa was reported to have personally supervised the massacre of 100 of the schoolchildren by his Imperial Guard. On 20 September 1979, French paratroopers deposed him and re-installed Dacko as president. Bokassa went into exile in France where he had a château and other property bought with the money he had embezzled. After his overthrow in 1979, Central Africa reverted to its former name and status as the Central African Republic. In his absence, he was tried and sentenced to death. He returned to the Central African Republic in 1986 and was put on trial for treason and murder. In 1987, he was cleared of charges of cannibalism, but found guilty of the murder of schoolchildren and other crimes. The death sentence was later commuted to life in solitary confinement, but just six years later, in 1993, he was freed. He lived a private life in his former capital, Bangui, and died in November 1996. Bokassa was born on 22 February 1921 as one of 12 children to Mindogon Bokassa, a village chief, and his wife Marie Yokowo in Bobangui, a large M'Baka village in the Lobaye basin located at the edge of the equatorial forest, then a part of colonial French Equatorial Africa, some 80 kilometres (50 mi) southwest of Bangui. Mindogon was forced to organise the rosters of his village people to work for the French Forestière company. After hearing about the efforts of a prophet named Karnu to resist French rule and forced labour, Mindogon decided that he would no longer follow French orders. He released some of his fellow villagers who were being held hostage by the Forestière. The company considered this to be a rebellious act, so they detained Mindogon, and took him away bound in chains to Mbaïki. On 13 November 1927, he was beaten to death in the town square just outside the prefecture office. A week later, Bokassa's mother, unable to bear the grief of losing her husband, committed suicide. Bokassa's extended family decided that it would be best if he received a French-language education at the École Sainte-Jeanne d'Arc, a Christian mission school in Mbaïki. As a child, he was frequently taunted by his classmates about his orphanhood. He was short in stature and physically strong. In his studies, he became especially fond of a French grammar book by an author named Jean Bédel. His teachers noticed his attachment, and started calling him "Jean-Bédel". During his teenage years, Bokassa studied at École Saint-Louis in Bangui, under Father Grüner. Grüner educated Bokassa with the intention of making him a priest, but realized that his student did not have the aptitude for study or the piety required for this occupation. He then studied at Father Compte's school in Brazzaville, where he developed his abilities as a cook. After graduating in 1939, Bokassa took the advice offered to him by his grandfather, M'Balanga, and Father Grüner, by joining the French colonial troops as a tirailleur (rifleman) on 19 May 1939. While serving in the Second bataillon de marche, Bokassa became a corporal in July 1940 and a sergeant major in November 1941. After the occupation of France by Nazi Germany, Bokassa served with an African unit of the Free French Forces and took part in the capture of the Vichy government's capital at Brazzaville. On 15 August 1944, he participated in the Allied Forces’ landing in Provence, France, in Operation Dragoon, and fought in southern France and in Germany in early 1945 before Nazi Germany was toppled. He remained in the French Army after the war, studying radio transmissions at an army camp in the French coastal town of Fréjus. Afterwards, he attended officer training school in Saint-Louis, Senegal. On 7 September 1950, Bokassa headed to Indochina as the transmissions expert for the battalion of Saigon-Cholon. Bokassa saw some combat during the First Indochina War before his tour of duty ended in March 1953. For his exploits in battle, he was honored with membership of the Légion d'honneur, and was decorated with Croix de guerre. During his stay in Indochina, he married a 17-year-old Vietnamese girl named Nguyễn Thị Huệ. After Hué bore him a daughter, Bokassa had the child registered as a French national. Bokassa left Indochina without his wife and child, as he believed he would return for another tour of duty in the near future. Upon his return to France, Bokassa was stationed at Fréjus, where he taught radio transmissions to African recruits. In 1956, he was promoted to Second Lieutenant and two years later to Lieutenant. Bokassa was then stationed as a military technical assistant in December 1958 in Brazzaville, and in 1959 after a twenty-year absence he was posted back to his homeland in Bangui. He was promoted to the rank of Captain on 1 July 1961. 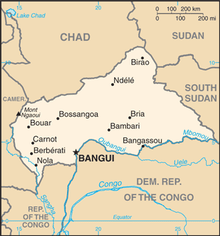 The French colony of Ubangi-Chari (Oubangui-Chari in French), part of French Equatorial Africa, had become a semi-autonomous territory of the French Community in 1958 and then an independent nation as the Central African Republic on 13 August 1960. On 1 January 1962, Bokassa left the French Army and joined the military forces of the CAR with the rank of battalion commandant under then commander-in-chief Mgboundoulou. As a cousin of the CAR President David Dacko and nephew of Dacko's predecessor Barthélémy Boganda, Bokassa was given the task of creating the new country's military. Over a year later, Bokassa became commander-in-chief of the 500 soldiers in the Central African Army. Due to his relationship to Dacko and experience abroad in the French military, Bokassa was able to quickly rise through the ranks of the new national army, becoming the Central African Army's first colonel on 1 December 1964. Bokassa sought recognition for his status as leader of the army. He frequently appeared in public wearing all his military decorations, and in ceremonies, he often sat next to President Dacko to display his importance in the government. Bokassa frequently got into heated arguments with Jean-Paul Douate, the government's chief of protocol, who admonished him for not following the correct order of seating at presidential tables. At this time Mgboundoulou no longer advocated his status as leader of the army. At first, Dacko found his cousin's antics amusing. Despite the number of recent military coups in Africa, Dacko publicly dismissed the likelihood that Bokassa would try to take control of the country. At an official dinner, he said, "Colonel Bokassa only wants to collect medals and he is too stupid to pull off a coup d'état". Other members of Dacko's cabinet believed that Bokassa was a genuine threat to the regime. Jean-Arthur Bandio, the minister of interior, suggested Dacko name Bokassa to the Cabinet, which he hoped would both break the colonel's close connections with the CAR army and satisfy the colonel's desire for recognition. To combat the chance that Bokassa would stage a coup, Dacko created the gendarmerie, an armed police force of 500 and a 120-member presidential security guard, led by Jean Izamo and Prosper Mounoumbaye, respectively. Dacko's government faced a number of problems during 1964 and 1965: the economy experienced stagnation, the bureaucracy started to fall apart, and the country's boundaries were constantly breached by Lumumbists from the south and the rebel Sudan People's Liberation Army from the east. Under pressure from political radicals in the Mouvement pour l'évolution sociale de l'Afrique noire (Movement for the Social Evolution of Black Africa or MESAN) and in an attempt to cultivate alternative sources of support and display his ability to make foreign policy without the help of the French government, Dacko established diplomatic relations with Mao Zedong's People's Republic of China (PRC) in September 1964. A delegation led by Meng Yieng and agents of the Chinese government toured the country, showing communist propaganda films. Soon after, the PRC gave the CAR an interest-free loan of one billion CFA francs (20 million French francs). The aid failed to subdue the prospect of a financial collapse for the country. Widespread corruption by government officials and politicians added to the country's list of problems. Bokassa felt that he needed to take over the CAR government to solve all the country's problems—most importantly, to rid the country from the influence of communism. According to Samuel Decalo, a scholar of African government, Bokassa's personal ambitions played the most important role in his decision to launch a coup against Dacko. Dacko sent Bokassa to Paris as part of the country's delegation for the Bastille Day celebrations in July 1965. After attending the celebrations and a 23 July ceremony to mark the closing of a military officer training school he had attended decades earlier, Bokassa decided to return to the CAR. However, Dacko forbade his return, and the infuriated Bokassa spent the next few months trying to obtain supporters from the French and Central African armed forces, who he hoped would force Dacko to reconsider his decision. Dacko eventually yielded to pressure and allowed Bokassa back in October 1965. Bokassa claimed that Dacko finally gave up after French President Charles de Gaulle had personally told Dacko that "Bokassa must be immediately returned to his post. I cannot tolerate the mistreatment of my companion-in-arms". Tensions between Dacko and Bokassa continued to escalate in the coming months. In December, Dacko approved an increase in the budget for Izamo's gendarmerie, but rejected the budget proposal Bokassa had made for the army. At this point, Bokassa told friends he was annoyed by Dacko's mistreatment and was "going for a coup d'état". Dacko planned to replace Bokassa with Izamo as his personal military adviser, and wanted to promote army officers loyal to the government, while demoting Bokassa and his close associates. Dacko did not conceal his plans. He hinted at his intentions to elders of the Bobangui village, who in turn informed Bokassa of the plot. Bokassa realized he had to act against Dacko quickly, and worried that his 500-man army would be no match for the gendarmerie and the presidential guard. He was also overwrought over the possibility that the French would come to Dacko's aid after the coup d'état, as had occurred after one in Gabon against President Léon M'ba in February 1964. After receiving word of the coup from the country's vice president, officials in Paris sent paratroopers to Gabon in a matter of hours and M'Ba was quickly restored to power. Bokassa received substantive support from his co-conspirator, Captain Alexandre Banza, who commanded the Camp Kassaï military base in northeast Bangui, and, like Bokassa, had been stationed with the French army around the world. Banza was an intelligent, ambitious and capable man who played a major role in the planning of the coup. By December, many people began to anticipate the political turmoil that would soon engulf the country. Dacko's personal advisers alerted him that Bokassa "showed signs of mental instability" and needed to be arrested before he sought to bring down the government, but Dacko did not heed these warnings. A map of the Central African Republic. Dacko left the Palais de la Renaissance early in the evening of 31 December 1965 to visit one of his ministers' plantations southwest of Bangui. An hour and a half before midnight, Captain Banza gave orders to his officers to begin the coup. Bokassa called Izamo at his headquarters and asked him to come to Camp de Roux to sign some documents that needed his immediate attention. Izamo, who was at a New Year's Eve celebration with friends, reluctantly agreed and travelled to the camp. Upon arrival, he was confronted by Banza and Bokassa, who informed him of the coup in progress. After declaring his opposition to the coup, Izamo was taken by the coup plotters to an underground cellar. Around midnight, Bokassa, Banza and their supporters left Camp de Roux to take over the capital. After seizing the capital in a matter of hours, Bokassa and Banza rushed to the Palais de la Renaissance in order to arrest Dacko. Dacko was nowhere to be found. Bokassa panicked, believing the president had been warned of the coup in advance, and immediately ordered his soldiers to search for Dacko in the countryside until he was found. Centrafricains! Centrafricains! C'est le colonel Bokassa qui vous parle. Depuis 3h00 ce matin, votre armée a pris le contrôle du gouvernement. Le gouvernement Dacko a démissionné. L'heure de la justice est à portée de main. La bourgeoisie est abolie. Une nouvelle ère de l'égalité entre tous a commencé. Centrafricains, où que vous soyez, soyez assuré que l'armée va vous défendre et de vos biens... Vive la République centrafricaine! Translation: Central Africans! Central Africans! This is Colonel Bokassa speaking to you. At 3:00 a.m. this morning, your army took control of the government. The Dacko government has resigned. The hour of justice is at hand. The bourgeoisie is abolished. A new era of equality among all has begun. Central Africans, wherever you may be, be assured that the army will defend you and your property ... Long live the Central African Republic! Bokassa with Nicolae Ceaușescu of Romania, 1970. In the early days of his regime, Bokassa engaged in self-promotion before the local media, showing his countrymen his French army medals, and displaying his strength, fearlessness and masculinity. He formed a new government called the Revolutionary Council, invalidated the constitution and dissolved the National Assembly. He called it "a lifeless organ no longer representing the people". In his address to the nation, Bokassa claimed that the government would hold elections in the future, a new assembly would be formed, and a new constitution would be written. He also told his countrymen that he would give up his power after the communist threat had been eliminated, the economy stabilized, and corruption rooted out. President Bokassa allowed MESAN to continue functioning. All other political organizations were barred from the country. In the coming months, Bokassa imposed a number of new rules and regulations: men and women between the ages of 18 and 55 had to provide proof that they had jobs, or else they would be fined or imprisoned. Begging was banned. Tom-tom playing was allowed only during the nights and weekends. A "morality brigade" was formed in the capital to monitor bars and dance halls. Polygamy, dowries and female circumcision were all abolished. Bokassa also opened a public transport system in Bangui made up of three interconnected bus lines through the capital city as well as a ferry service on the Ubangi river, and subsidized the creation of two national orchestras. Despite the positive changes in the country, Bokassa had difficulty obtaining international recognition for his new government. He tried to justify the coup by explaining that Izamo and communist Chinese agents were trying to take over the government and that he had to intervene to save the CAR from the influence of communism. He alleged that Chinese agents in the countryside had been training and arming locals to start a revolution, and on 6 January 1966, he dismissed the communist agents from the country and cut off diplomatic relations with China. Bokassa also believed that the coup was necessary in order to prevent further corruption in the government. Bokassa first secured diplomatic recognition from President François Tombalbaye of neighboring Chad, whom he met in Bouca, Ouham. After Bokassa reciprocated by meeting Tombalbaye on 2 April 1966 along the southern border of Chad at Fort Archambault, the two decided to help one another if either was in danger of losing power. Soon after, other African countries began to diplomatically recognize the new government. At first, the French government was reluctant to support the Bokassa regime, so Banza went to Paris to meet with French officials to convince them that the coup was necessary to save the country from turmoil. Bokassa met with Prime Minister Georges Pompidou on 7 July 1966, but the French remained noncommittal in offering their support. After Bokassa threatened to withdraw from the franc monetary zone, President Charles de Gaulle decided to make an official visit to the CAR on 17 November 1966. To the Bokassa regime, this visit meant that the French had finally accepted the new changes in the country. Bokassa and Banza had a major argument over the country's budget, as Banza adamantly opposed the president's extravagant spending. Bokassa moved to Camp de Roux, where he felt he could safely run the government without having to worry about Banza's thirst for power. In the meantime, Banza tried to obtain a support base within the army, spending much of his time in the company of soldiers. Bokassa recognized what his minister was doing, so he sent military units most sympathetic to Banza to the country's border and brought his own army supporters as close to the capital as possible. In September 1967, he took a special trip to Paris, where he asked for protection from French troops. Two months later, the French government deployed 80 paratroopers to Bangui. On 13 April 1968, in another one of his frequent cabinet reshuffles, Bokassa demoted Banza to minister of health, but let him remain in his position as minister of state. Cognizant of the president's intentions, Banza increased his vocalization of dissenting political views. A year later, after Banza made a number of remarks highly critical of Bokassa and his management of the economy, the president, perceiving an immediate threat to his power, removed him as his minister of state. Banza revealed his intention to stage a coup to Lieutenant Jean-Claude Mandaba, the commanding officer of Camp Kassaï, whom he looked to for support. Mandaba went along with the plan, but his allegiance remained with Bokassa. When Banza contacted his co-conspirators on 8 April 1969, informing them that they would execute the coup the following day, Mandaba immediately phoned Bokassa and informed him of the plan. When Banza entered Camp Kassaï on 9 April 1969, he was ambushed by Mandaba and his soldiers. The men had to break Banza's arms before they could overpower and throw him into the trunk of a Mercedes and take him directly to Bokassa. At his house in Berengo, Bokassa nearly beat Banza to death before Mandaba suggested that Banza be put on trial for appearance's sake. Two versions concerning the end circumstances of his death differ on one minor detail. Did Bokassa tie him to a pillar before personally carving him with a knife that he had previously used for stirring his coffee in the gold-and-midnight blue Sèvres coffee set, or was the murder committed on the cabinet table with the help of other persons? Late that afternoon, soldiers dragged a still identifiable corpse, with the spinal column smashed, from barrack to barrack to serve as an example. In 1971, Bokassa promoted himself to full general, and on 4 March 1972 declared himself president for life. He survived another coup attempt in December 1974. The following month, on 2 January, he relinquished the position of prime minister to Elisabeth Domitien, who became the first woman to hold the position. He had earlier appointed the CAR's first female government minister, Marie-Joséphe Franck, in February 1970. Over time, Bokassa's domestic and foreign policies became increasingly unpredictable, leading to another assassination attempt at Bangui M'Poko International Airport in February 1976. Muammar al-Gaddafi aided Bokassa. France also lent support. In 1975, the French president Valéry Giscard d'Estaing declared himself a "friend and family member" of Bokassa. By that time France supplied its former colony's regime with financial and military backing. In exchange, Bokassa frequently took Giscard on hunting trips in Central Africa and supplied France with uranium, which was vital for France's nuclear energy and weapons program in the Cold War era. The "friendly and fraternal" cooperation with France—according to Bokassa's own terms—reached its peak with the imperial coronation ceremony of Bokassa I on 4 December 1977. The French Defence Minister sent a battalion to secure the ceremony; he also lent 17 aircraft to the new Central African Empire's government, and even assigned French Navy personnel to support the orchestra. The coronation ceremony lasted for two days and cost 10 million GBP, more than the annual budget of the Central African Republic. The ceremony was organized by French artist Jean-Pierre Dupont. Parisian jeweller Claude Bertrand made his crown, which included diamonds. Bokassa sat on a two-ton throne modeled in the shape of a large eagle made from solid gold. On 10 October 1979, the French Canard Enchaîné satirical newspaper reported that President Bokassa had offered the then Minister of Finance Giscard two diamonds in 1973. This soon became a major political scandal known as the Diamonds Affair, which contributed significantly to Giscard's losing his reelection bid in 1981. The Franco-Central African relationship drastically changed when France's Renseignements Généraux intelligence service learned of Bokassa's willingness to become a partner of Muammar al-Gaddafi of Libya. After a meeting with Gaddafi in September 1976, Bokassa converted to Islam and changed his name to Salah Eddine Ahmed Bokassa, but in December 1976 he converted back to Catholicism. It is presumed that his conversion to Islam was a ploy calculated to ensure ongoing Libyan financial aid. When no funds promised by Gaddafi were forthcoming, Bokassa abandoned his new faith—which was also incompatible with his plans to be crowned emperor in the Catholic cathedral in Bangui. The Imperial Standard of Bokassa I. In September 1976, Bokassa dissolved the government and replaced it with the Conseil de la Révolution Centrafricaine (Central African Revolutionary Council). On 4 December 1976, at the MESAN congress, Bokassa converted back to Catholicism and instituted a new constitution that transformed the republic into the Central African Empire (CAE), with himself as "S.M.I. (Sa Majesté Impériale "His Imperial Majesty") Bokassa 1er." He was formally crowned in a coronation ceremony on 4 December 1977. Bokassa's full title was Empereur de Centrafrique par la volonté du peuple Centrafricain, uni au sein du parti politique national, le MESAN ("Emperor of Central Africa by the will of the Central African people, united within the national political party, the MESAN"). His regalia, lavish coronation ceremony and regime of the newly formed Central African Empire were largely inspired by Napoleon I of France, who had converted the French Revolutionary Republic of which he was First Consul into the First French Empire. The coronation ceremony was estimated to cost his country roughly 20 million US dollars – one third of the CAE's annual budget and all of France's aid money for that year. Bokassa attempted to justify his actions by claiming that creating a monarchy would help Central Africa "stand out" from the rest of the continent, and earn the world's respect. Despite generous invitations, no foreign leaders attended the event. By this time, many people inside and outside the CAE thought Bokassa was insane. The Western press, mostly in France, the UK, and USA, considered him a laughing stock, and often compared his eccentric behavior and egotistical extravagance with that of another well-known eccentric African dictator, Idi Amin of Uganda. Tenacious rumors that he occasionally consumed human flesh were found unproven during his eventual trial. Bokassa claimed that the new empire would be a constitutional monarchy. In practice, however, he retained the same dictatorial powers he had held as President Bokassa, and the country remained a military dictatorship. Suppression of dissenters remained widespread, and torture was said to be especially rampant. Rumours abounded that Bokassa himself occasionally participated in beatings and executions. By January 1979, French support for Bokassa had all but eroded after food riots in Bangui led to a massacre of civilians. The final straw came between 17 April and 19 April, when a large number of elementary school students in Bangui and elsewhere in the country were arrested after they had protested against paying for and wearing the expensive, government-required school uniforms with Bokassa's image on them. Around 100 children were killed. Bokassa allegedly participated in the massacre, appearing at the jail and beating some of the children to death with his cane. The massive worldwide press coverage which followed the deaths of the students opened the way for a successful coup which saw French troops (in "Opération Barracuda") invaded the Central African Empire and restored former president David Dacko to power while Bokassa fled into exile by airplane to the Ivory Coast on 20 September 1979. Operation Caban began on the evening of 20 September and ended early the next morning as the first phase of Bokassa's overthrow. An undercover commando squad from the French intelligence agency SDECE (now DGSE), joined by Special Forces' 1st Marine Infantry Parachute Regiment, or 1er RPIMa, led by Colonel Brancion-Rouge, landed by Transall and secured Bangui M'Poko International Airport with little resistance. Upon arrival of two more French military transport aircraft containing over 300 French troops, a message was then sent by Colonel Brancion-Rouge to Colonel Degenne to trigger the second phase known as Operation Barracuda to have him come in with his Barracudas (codename for eight Puma helicopters and Transall aircraft). These aircraft took off from N'Djamena military airport in neighbouring Chad in order to occupy the capital city as a peace-securing intervention. By 12:30 p.m. on 21 September 1979, the pro-French Dacko proclaimed the fall of the Central African Empire and the restoration of the Central African Republic under his presidency. David Dacko remained president until he was overthrown on 1 September 1981 by André Kolingba. Bokassa, who was visiting Libya on a state visit at the time, fled to Ivory Coast where he spent four years living in Abidjan. He then moved to France where he was allowed to settle in his Chateau d'Hardricourt in the suburb of Paris. France gave him political asylum because of his service in the French military. During Bokassa's seven years in exile, he wrote his memoirs after complaining that his French military pension was insufficient. But the French courts ordered that all 8,000 copies of the book be confiscated and destroyed after his publisher claimed that Bokassa said that he shared women with President Valéry Giscard d'Estaing, who had been a frequent guest in the Central African Republic. Bokassa also claimed to have given Giscard a gift of diamonds worth around US$250,000 in 1973 while the French president was serving as finance minister. Giscard's next presidential reelection campaign failed in the wake of the scandal. Bokassa's presence in France proved embarrassing to many government ministers who supported him during his rule. Bokassa owned the Château du Grand Chavanon, a historic chateau in Neuvy-sur-Barangeon, France from the 1970s to 1995. He rented it to the Cercle national des combattants, a non-profit organization run by National Front politician Roger Holeindre from 1986 to 1995, when the Cercle purchased it from Bokassa. Bokassa had been tried and sentenced to death in absentia in December 1980 for the murder of numerous political rivals. He returned from exile in France on 24 October 1986. Bokassa was immediately arrested by the Central African authorities as soon as he stepped off the plane and was tried for 14 different charges, including treason, murder, cannibalism, illegal use of property, assault and battery, and embezzlement. Now that Bokassa was unexpectedly in the hands of the Central African Republic government, they were required by law to try him in person, granting him the benefit of defence counsel. At Bokassa's court arraignment, the in absentia 1980 verdict was overturned and a new trial was ordered for him. Bokassa pleaded not guilty to all of the charges against him. Bokassa's trial began on 15 December 1986, taking place in the hot and humid, non-air-conditioned chambers of the Palais de Justice in Bangui. Bokassa hired two French lawyers, François Gilbault and Francis Szpiner, who faced a panel modelled on the French legal system, composed of six jurors and three judges, presided over by High Court Judge Edouard Franck. The trial by jury of a former head of state was unprecedented in the history of post-colonial Africa, where former dictators had previously been tried and executed following show trials. In another regional innovation, access to the trial was granted to the public; this meant that the courtroom was constantly filled with standing-room-only spectators. There were live French-language broadcasts by Radio Bangui and local TV news crews broadcast all over the country, as well as neighbouring French-speaking African countries. The trial was listened to and watched by many in the Central African Republic and in neighbouring countries who had access to a radio or TV set. The prosecutor was Gabriel-Faustin M'Boudou, the Chief Prosecutor of the CAR, who called various witnesses to testify against Bokassa, which included remembering victims ranging from political enemies to a newborn son of a palace guard commander who had been executed for attempting to kill Bokassa in 1978 when he was the self-proclaimed emperor. A hospital nurse testified that Bokassa was said to have killed the delivered child with an injection of poison. Next, testimony came from 27 teenagers and young adults who claimed to be former school children who testified as being the only survivors of the 180 children arrested in April 1979. The arrests came after the children threw rocks at Bokassa's passing Rolls-Royce during protests over wearing the costly school uniforms which they were forced to purchase from a factory (supposedly owned by one of the former leader's wives). Several of them testified that on their first night in jail, Bokassa visited the prison and screamed at the children for their insolence. He was said to have ordered the prison guards to club the children to death, and Bokassa participated, smashing the skulls of at least five children with his ebony walking stick. Throughout the trial, Bokassa denied all the charges against him. He attempted to shift the blame away from himself to wayward members of his former cabinet and the army for any misdeeds that might have occurred during his reign as both president and emperor. Testifying in his own defence, Bokassa stated: "I'm not a saint. I'm just a man like everyone else." As testimony against him mounted, he gave away at several times his legendary short temper. Bokassa once stood up and raged at chief prosecutor M'Boudou: "The aggravating thing about all this is that it's all about Bokassa, Bokassa, Bokassa! I have enough crimes levelled against me without you blaming me for all the murders of the last 21 years!" One of the most lurid allegations against Bokassa was that of cannibalism. In the Central African Republic, statutes forbidding cannibalism classified any crime of eating human remains as a misdemeanour. Upon seizing power from David Dacko in 1981, the current President André Kolingba had declared amnesty for all misdemeanours committed during the tenure of his predecessors. Bokassa could not be charged or convicted with the crime, even if there was evidence of guilt. The cannibalism charges against him were brought from old indictments in 1980 that resulted in his conviction in absentia, a year before Kolingba's amnesty, so the anthropophagy charge remained listed among Bokassa's crimes. Former president Dacko was called to the witness stand to testify that he had seen photographs of butchered bodies hanging in the dark cold-storage rooms of Bokassa's palace immediately after the 1979 coup. When the defence put up a reasonable doubt during the cross-examination of Dacko that he could not be positively sure if the photographs he had seen were of dead bodies to be used for consumption, Bokassa's former security chief of the palace was called to testify that he had cooked human flesh stored in the walk-in freezers and served it to Bokassa on an occasional basis. The prosecution did not examine the rumours that Bokassa had served the flesh of his victims to French President Giscard and other visiting dignitaries. The government prosecutors hired Bernard Jouanneau, a French lawyer to investigate as well as recover some of the millions of CAR francs that Bokassa had diverted from the national treasury and from both social and charity funds for his own personal use in the embezzlement charges. Late in the trial, Bokassa's lawyers tried to bar Jouanneau from testifying. On 12 June 1987, Bokassa was acquitted on charges of cannibalism, but found guilty on all of the other charges. The court acknowledged that many individual allegations of murder had been levelled at Bokassa but found that the evidence was unimpeachable in only about 20 cases. Bokassa was said to have wept silently as Judge Franck sentenced him to death. Szpiner and Gibault appealed the verdict for a retrial on the grounds that the Central African Republic's constitution allowed a former head of state to be charged only with treason. The CAR supreme court rejected the appeal. On 29 February 1988, President Kolingba demonstrated his opposition to capital punishment by voiding the death penalty against Bokassa and commuted his sentence to life in prison in solitary confinement, and the following year reduced the sentence to 20 years. With the return of democracy to the Central African Republic in 1993, Kolingba declared a general amnesty for all prisoners as one of his final acts as President, and Bokassa was released on 1 August 1993. Bokassa remained in the CAR for the rest of his life. In 1996, as his health declined, he proclaimed himself the 13th Apostle and claimed to have secret meetings with the Pope. Bokassa died of a heart attack on 3 November 1996 at his home in Bangui at the age of 75. He had 17 wives, one of whom was Marie-Reine Hassen, and a reported 50 children, three of which included Jean-Bédel Bokassa, Crown Prince of the Central African Empire, Jean-Serge Bokassa, and Kiki Bokassa. In 2010, President François Bozizé issued a decree rehabilitating Bokassa and calling him "a son of the nation recognised by all as a great builder". The decree went on to hold that "This rehabilitation of rights erases penal condemnations, particularly fines and legal costs, and stops any future incapacities that result from them". In the lead-up to this official rehabilitation, Bokassa has been praised by CAR politicians for his patriotism and for the periods of stability that he brought the country. 22 February 1921 – 4 December 1976: Jean-Bédel Bokassa. 4 December 1976 – 21 September 1979: His Imperial Majesty the Emperor of Central Africa. 21 September 1979 – 3 November 1996: Jean-Bédel Bokassa. This page is based on the Wikipedia article Jean-Bédel Bokassa; it is used under the Creative Commons Attribution-ShareAlike 3.0 Unported License (CC-BY-SA). You may redistribute it, verbatim or modified, providing that you comply with the terms of the CC-BY-SA.